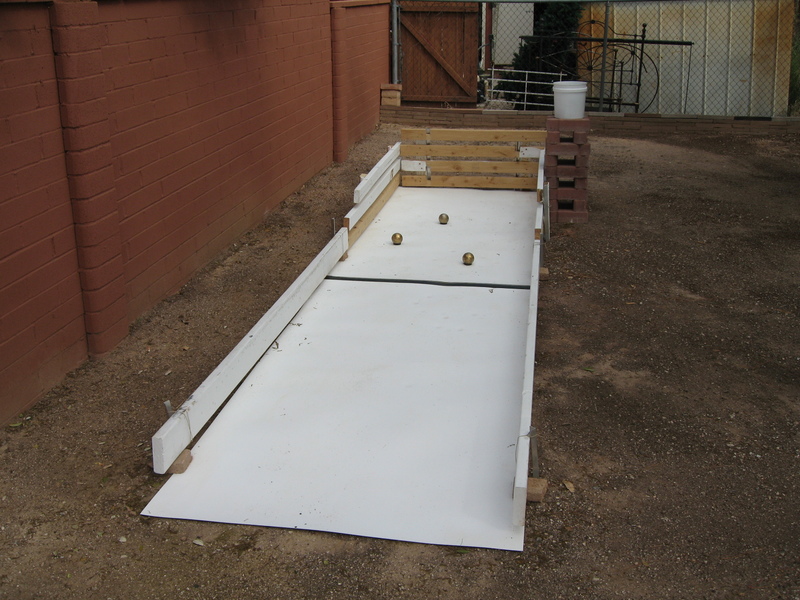 Here is an easy and inexpensive way to make a very effective target for shooting practice. My hobby is experimenting with designs for shooting pits. Here is my fourth design. 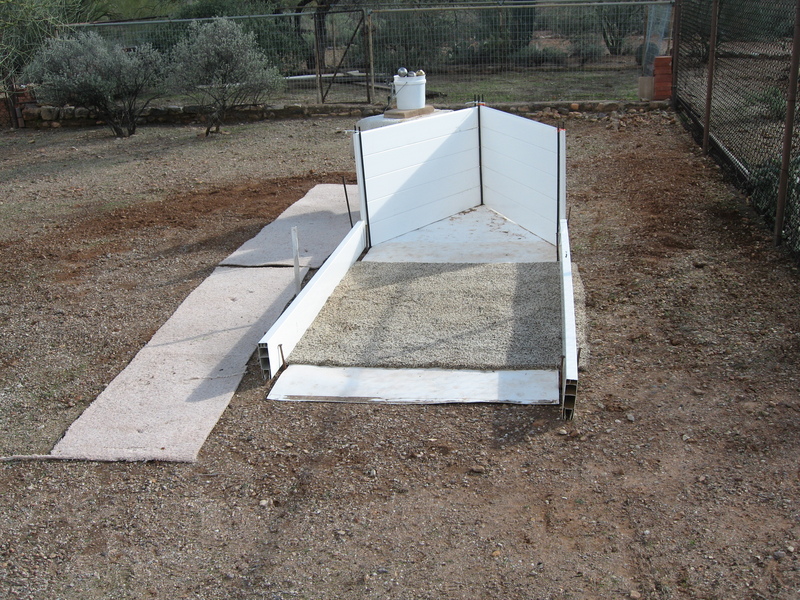 Like my second design it copies the layout of a horseshoe pit. Like my first design, the back-stops are V-shaped, which makes the boules easy to gather. 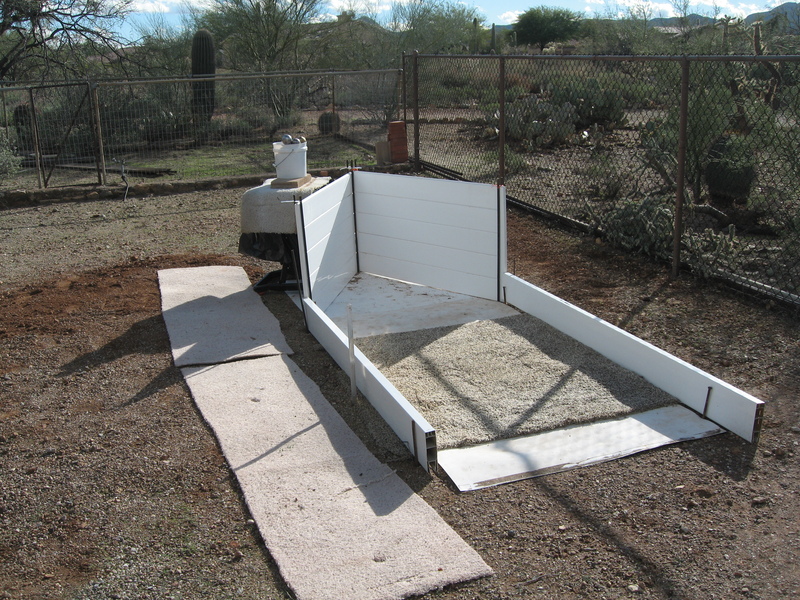 The backstop is constructed out of lightweight hollow-core plastic boards designed for fence construction (see detail photo, below.) (I got them cheap, at a recycled building-materials yard.) It is 2.5 feet high, although two feet would probably have been enough. Click on any of the photos to see a larger view. 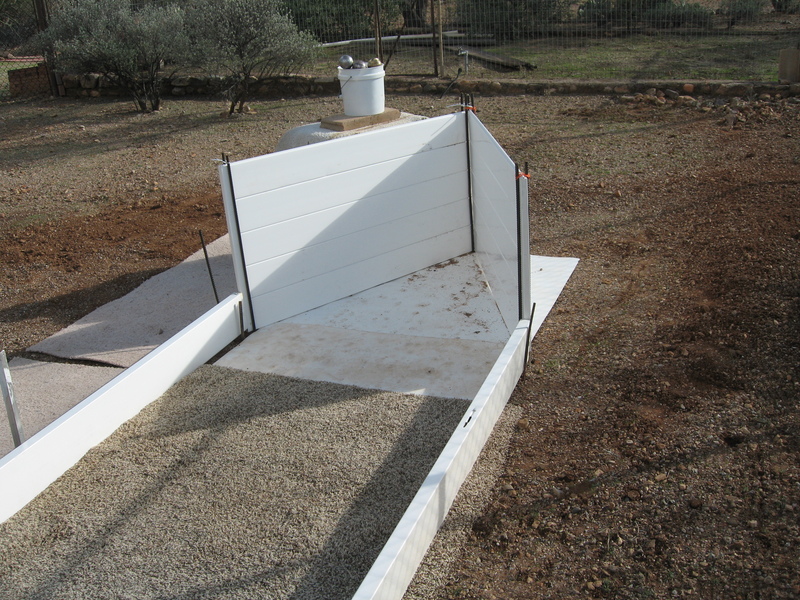 The backstop is constructed out of lightweight hollow-core plastic boards designed for fence construction. Here is my third design. I’m quite happy with it. It will probably be my last design. This is the most light-weight of all my designs. 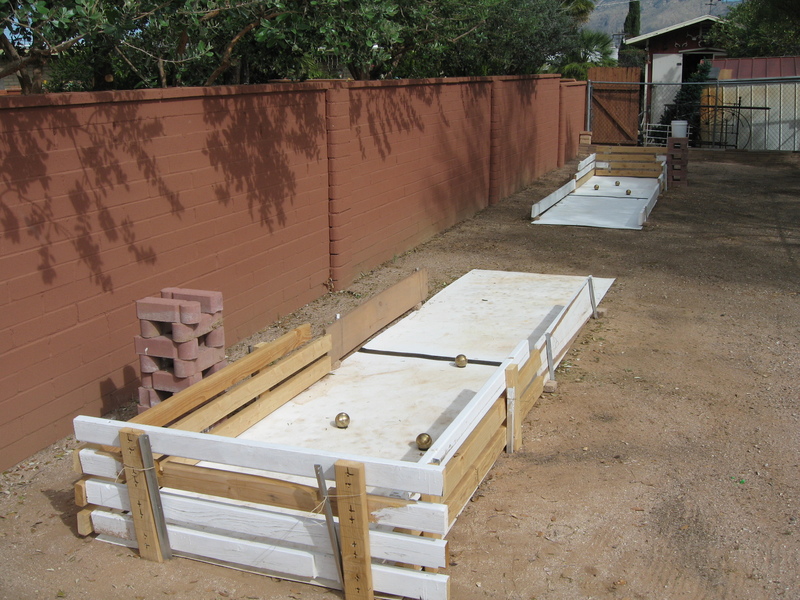 It consists of three sawhorses made with 2x4s arranged in a U shape. The head is covered by a sheet of white Plas-Tek and a couple of carpet scraps. They protect the ground from being pulverized into dust, and keep the boules dirt-free so that I don’t have to be cleaning them all the time. From the sawhorses I have hung a 10’x16′ baseball net (from Networld Sports, on sale for about $60, including shipping). It is folded in half length-wise, so its dimensions are 5′ high by 16′ long. The upper edge is hung from the sawhorses. The lower edges are held close to the ground by cords threaded through the spaces in the net and nailed to the ground. As a boule-return device, there is a pipe made of three 10′ PVC pipes. The pipe leads from the head back to the throwing area. To return the boules, I walk to the head and put the boules in one end of the pipe. That takes only about one second per boule. Then I walk back to the head, where the pipe has deposited the boules in a bucket. 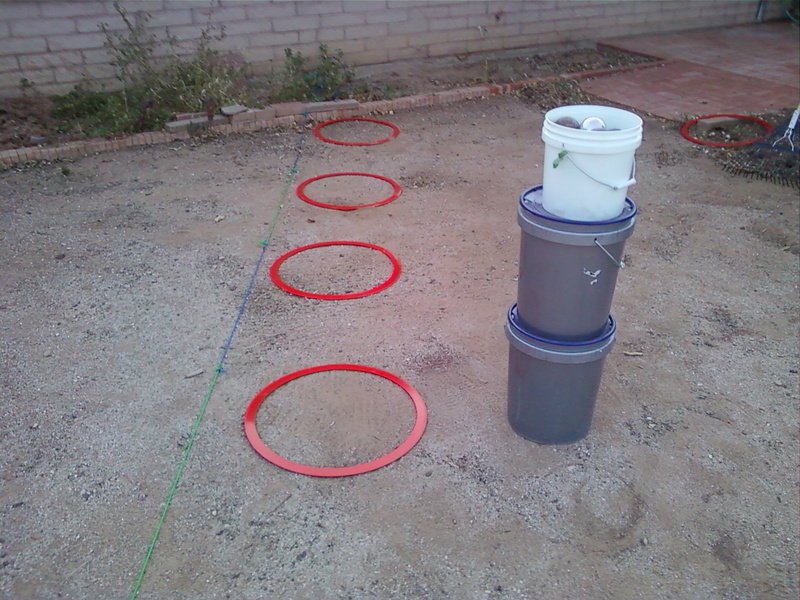 I lift the bucket onto a platform, so that I can easily grab the boules as I throw. I throw about 20 boules at a time. That is as many as I can lift in the bucket. Here is another picture. You can read about the frame with the colored ribbons HERE. Here is my second design. It is two shooting pits, facing each other. As in horseshoes, you stand at one end and throw into the opposite pit. Then you walk to the opposite pit, pick up your boules, and throw them back toward the other pit. Here is a closer view of one of the shooting pits. 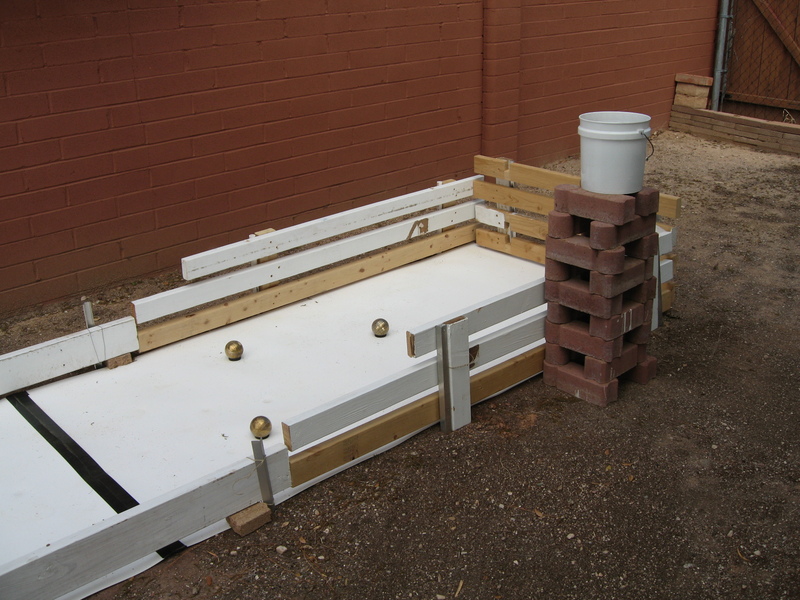 I built it out of scrap 2x4s but I think one-inch thick boards would work perfectly well. 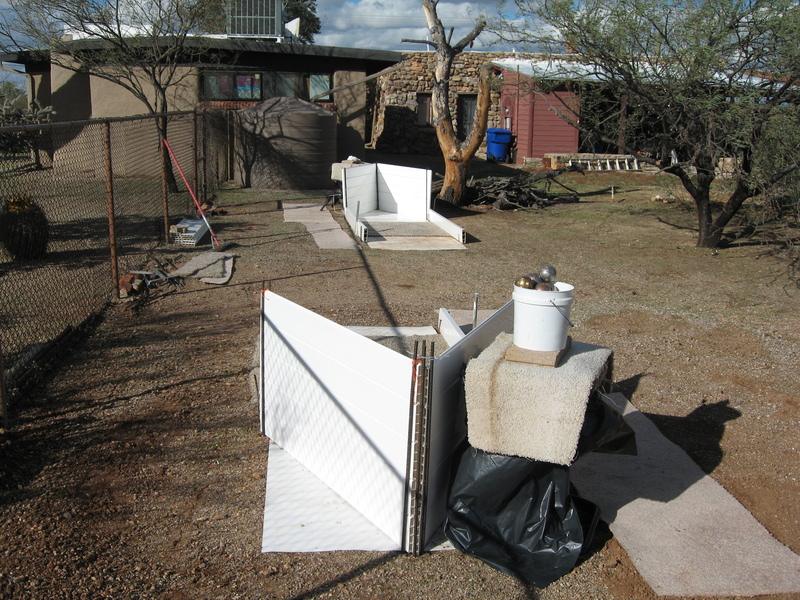 The white sheets on the ground are a plastic material called Plas-Tek. They are sold as construction material to line showers and should be available at your local Home Depot or Lowe’s. They come in 4’x8′ sheets, about 1/8″ thick, and cost about $20 each. The pit is out-of-doors, so I raised the sideboards about an inch off the ground. That allows rain to drain off, and allows me to sweep dust and fallen leaves under the sideboards and off of the court. When I pick up the boules I put them in a white plastic bucket on brick “towers” where they will be easy to reach as I throw. 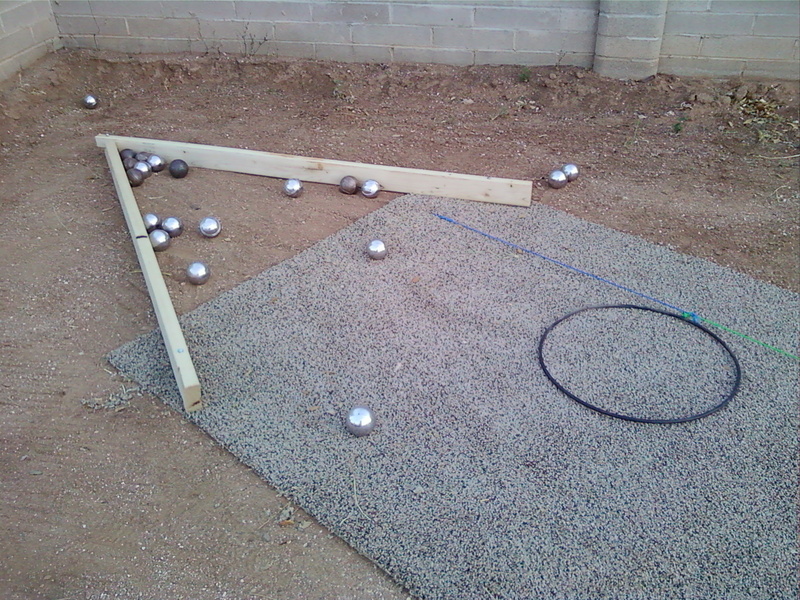 I’m new to petanque. I need to practice so I can hold up my end of the game. 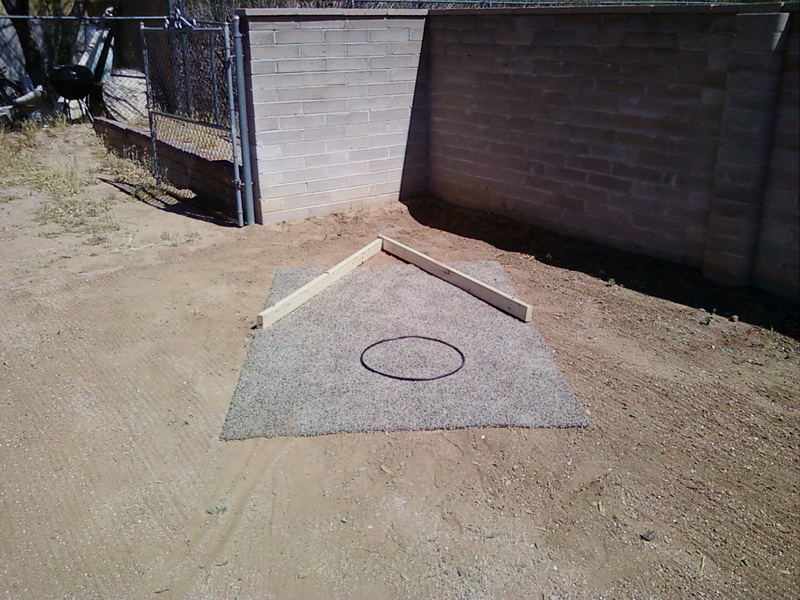 To help with practice, I have set up a sort of shooting pit in my back yard. I laid down a big piece of scrap carpet on the ground. (This keeps the ground from being pulverized into dust, and traps the dust.) On top of the carpet are two 2x4s, each about six feet long, in a V shape. This keeps (most of) the boules from scattering all over the back yard. 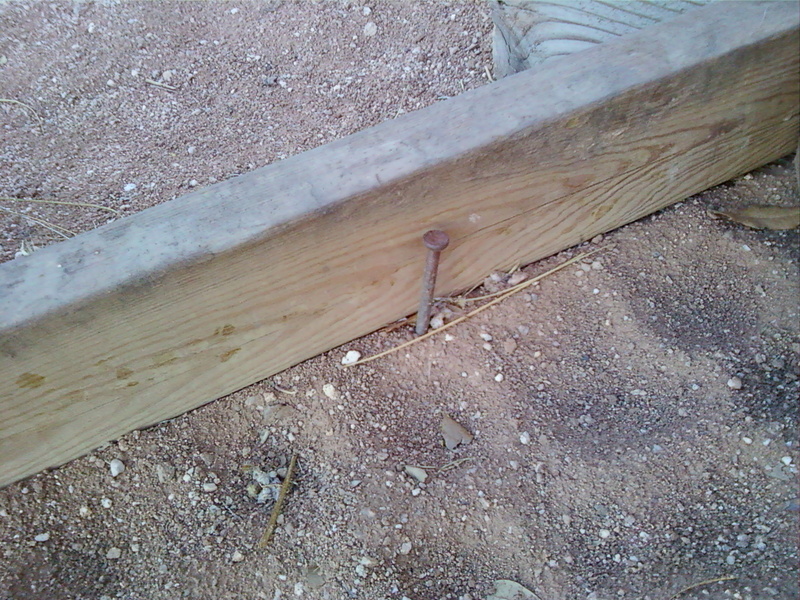 The 2x4s are secured with big nails driven into the ground. Later I moved the carpet forward a bit. 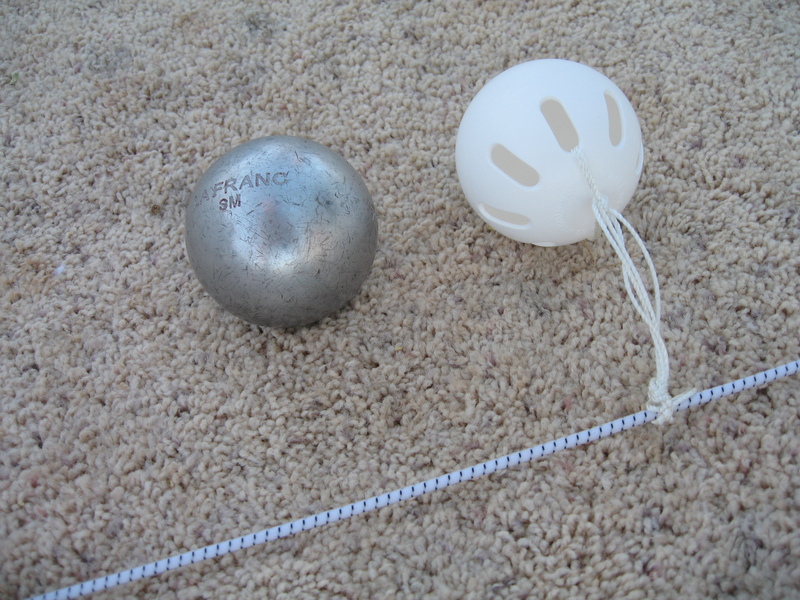 The depression behind the carpet traps the boules, so they can be gathered up more easily. In the throwing area (below) you can see a white plastic paint bucket. It can hold 20 leisure boules, so I can throw 20 boules before having to make a retrieval expedition up to the head. Beneath the white bucket are two larger grey paint buckets, bolted together. They make a platform that is portable and a convenient height. See my other experiments with designs for shooting pits.